It is delightfully fragrant, light, refreshing and gently tones my skin without any harsh chemicals or additives. 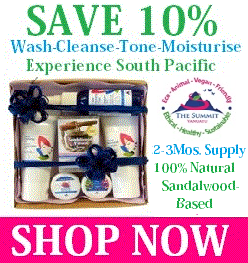 I use The Summit Vanuatu's Sandalwood Water as my toner and skin refresher of choice. It sets my skin up perfectly before I use my must have oils which are Good Vibes Omega Facial Oil and Trilogy Rosehip Antioxidant+. You can read my reviews if you click on the links. Sandalwood is considered to be the second most valuable and expensive wood in the world1. The heart wood from this tree gives one of the most valuable and fragrant oils in the world today, and throughout history. It is extensively used in the perfumery, cosmetics, aromatherapy and pharmaceutical industry. The oil is used for its therapeutic effects in Ayurveda, Chinese and Tibetan medicinal systems. It is used in the treatment of common colds, bronchitis, fever, dysentery, piles, scabies and infection of the urinary tract, inflammation of the mouth and pharynx, liver and gall-bladder complaints and as an expectorant, stimulant, carminative, digestive and as a muscle relaxant.2 Sandalwood oil is approved for use by the US Food and Drug Administration, Flavour and Extract Manufacturers Association, Council of Europe and Joint FAO/WHO Expert Committee on Food Additives3. Sandalwood has been prised throughout history for its healing properties and fragrance. Because Sandalwood is so highly valued, natural Sandalwood forests are under threat, especially in Southern India where they have been logged without thought to the environment, native forests or the future of the Sandalwood industry. This is why I am thrilled to write about products from sustainable Sandalwood plantations that are run by local communities and farmers for the benefit of their communities, and for a viable, environmentally sustainable Sandalwood industry. One such Company is the Summit Vanuatu whose motto is "Trade Not Aid". The Summit's Signature Range is sandalwood which is harvested from The Summit plantations as well as from Ni-Vanuatu growers in the islands of Tanna, Erromango and Aniwa in the south, and from Espiritu Santo in the north. Most other materials for their range of skin care are grown at The Summit, including the leaves from Tahitian limes and mandarins, tamanu seeds, ginger, lemongrass, vetiver grass and vanilla. Other essential oil producing plants are sourced from their local suppliers in Vanuatu. The Summit Vanuatu is proud to announce that they grow their own products, they produce their products and never use animal testing at any stage in their production. There is a direct link to their website for you to take a tour below. More recently studies have been conducted on its anti-cancer properties with extremely promising results whereby, the anticancer effects of α-santalol, a major component of sandalwood oil, have been reported against the development of certain cancers such as skin cancer both in vitro and in vivo.4 This is very good news for those of us who use natural, unadulterated Sandalwood products such as Sandalwood Water on our skin! Due to the high demand for Sandalwood and Sandalwood products, sustainable plantations are a must if this tree is to survive and thrive, as well as communities whose livelihood depends on the Sandalwood industry. The Summit Vanuatu grows over 120,000 trees on its own plantation, and has joint ventures with local Vanuatu farmers to supply Sandalwood, and carry out new plantings of over 50,000 new trees each year! This is a huge plus for the economy of Vanuatu and the local communities who rely on sustainable Sandalwood. As well as growing their own Sandalwood, this local company grows smaller orchards and plantations of Tahitian lime, mandarins, grapefruit, tangerines, canarium and tamanu nuts, ylang yang, ginger, turmeric, lemongrass, vetiver grass, coffee, and vanilla. All these home grown goodies are also used in their clean and green skincare range. I am very impressed with the prices of their products...I think that they are more than reasonable and they offer Free Shipping on all orders over $100. I do think that the packaging could be improved...but...it's not the packaging that I am putting on my skin! Besides, much of the packaging is recycled..so that is a good thing! I really enjoy using this product and I love the light Sandalwood fragrance. So if you are looking for some interesting skin care...then take a tour of The Summit Vanuatu site and see for yourself! I have also uploaded an informative PDF on the Sandalwood industry in Vanuatu if you are interested in further reading at the end of this review. 2. Hansda, R., The outlook for non wood forest products in Asia and the Pacific, Working Paper No. APFSOS II/WP/2009/18, Food and Agriculture Organisations Regional Office, Bangkok, 2009, p. 8, cited in Kumar, Joshi and Ram. 4. Bommareddy. A., Rule. B., VanWert. A.L., Santha. S., Dwivedi. C. α-Santalol, a derivative of sandalwood oil, induces apoptosis in human prostate cancer cells by causing caspase-3 activation, Phytomedicine vol19, issues 8-9, June 2012, p.804-811. If you purchase a product from The Summit Vanuatu from my website, I will receive a small renumeration to keep my website going. So thank you!